Dolphins 30 Bills 23 – By the time this game got interesting, the upper deck of Ralph Wilson Stadium had already cleared out and Reggie Bush was closing in on over 200 rushing yards. Even though Bush has had a solid season, I bet his old team the Saints are quite pleased to have 3rd down specialist Darren Sproles instead. Saints 42 Vikings 20 – Speaking of New Orleans, QB Drew Brees is now only 304 passing yards away from breaking Dan Marino’s single season record of 5,084 set back in 1984. His performance against the Vikings, 412 yards and 5 TD’s, probably pulls hims just about even with Aaron Rodgers in the race for the NFL MVP. Chiefs 19 Packers 14 – And while we’re on the subject of Rodgers, good for Romeo Crennel and the Kansas City Chiefs for ending Green Bay’s bid at a perfect season. And judging by the Chiefs reaction following the final whistle, it feels good to be free from the petulant gaze of recently fired head coach Todd Haley. Seahawks 38 Bears 14 – Remember during last years NFC Championship game when we all thought Caleb Hanie could be the long term solution for the Bears and an injured Jay Cutler? Yeah, about that. Might be time to start reexamining the entire quarterback depth chart in Chicago. Maybe even think about giving Donovan McNabb a call, he’s got some free time. Colts 27 Titans 13 – I called it! Well, sort of. I mean, I figured it was going to at least be close. But thanks to two former UConn Huskies, Dan Orlovsky and Donald Brown, Indianapolis gets off the schneid and can now begin focusing on trading Peyton Manning to the, gulp, Cowboys!?! Bengals 20 Rams 13 – St. Louis has a ton of problems but I do not see how giving up on QB Sam Bradford is part of the solution. Unless of course you use a top pick on Robert Griffin III and unleash The Greatest Show on Turf version 2.0. 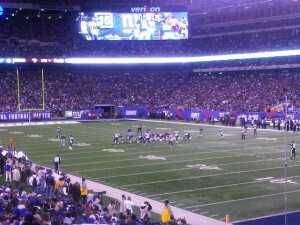 Redskins 23 Giants 10 – Pardon the Gmen for treating MetLife Stadium today like their own personal lavatory. That’s the kind of stench that lingers. Panthers 28 Texans 13 – I love a good fumblerooski. That’s the kind of stuff we use to pull during recess. And for Houston, I guess Wade Phillips is really that important to the defense. Lions 28 Raiders 27 – Megatron both won the game for Detroit and preserved, potentially, my fantasy football season. You’d have thought the Raiders would have put a man or two on him late in the 4th quarter. Patriots 41 Broncos 23 – While we all rest our #teboners for a second, it’s quite possible that the two best tight ends in the NFL play on the same team. The pairing of Aaron Hernandez and Rob Gronkowski needs a nickname. How about “Smash and Dash” or “Snake and Chopper”? Eagles 45 Jets 19 – I can’t believe this Philadelphia team still has a legitimate shot at making the playoffs. Andy Reid is like an old pair of underwear that just keeps turning up in your dresser. Cardinals 20 Browns 17 – Would the Arizona front office look stupid if they cut ties with Kevin Kolb this offseason? The way I see it, things are going just fine with John Skelton leading the show in Glendale. Texans 20 Bengals 19 – Could the TJ Yates Experience propel Houston all the way to a #1 or #2 seed and a 1st round bye in the AFC playoffs? And if so, would they be 3.5 point home dogs to either the Steelers or Ravens? Lions 34 Vikings 28 – “Detective” Joe Webb almost led Minnesota back from the brink and has perhaps stirred up a QB controversy in the Land of 10,000 Lakes. I say the Vikings transition to a two QB system, like a lot of college programs, with Christian Ponder in for passing plays and the Detective in for the spread option/wildcat. Could be a very nice compliment to Adrian Peterson. Saints 22 Titans 17 – Towards the end of the summer, I went out on a nice late afternoon jog and didn’t get more than a mile into it before I managed to pull both of my calf muscles nearly simultaneously. After that, I learned the value of a dynamic stretching routing before and after any cardiovascular activity. Here’s hoping Matt Hasselbeck has learned his lesson as well. Eagles 26 Dolphins 10 – Looks like I rode the Fins one too many weeks. 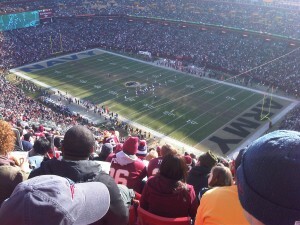 Patriots 34 Redskins 27 – The view for this post comes from my friend Chip who was sitting in the upper deck during today’s game at FedEx Field. Rest assured fellow Patriot fans, he told me that New England’s secondary is just as bad live, if not worse, than it is on tv. Falcons 31 Panthers 23 – Bill Simmons was right, it is next to impossible to tell Roddy White and Julio Jones apart. Jaguars 41 Buccaneers 14 – After watching the Jags play San Diego last Monday night, I didn’t think Blaine Gabbert was going to put up 41 points all season, let alone in one game. Ravens 24 Colts 10 – Baltimore is now 7-0 at home. Must be the band. Broncos 13 Bears 10 – You think there will be many people watching the Patriots/Broncos game next weekend? Cardinals 21 49ers 19 – Bad, bad loss for the Niners who are no longer assured of a 1st round bye in the NFC playoffs. And for Arizona, would you believe that the Cards still have a shot at making the postseason? Maybe it has something to do with Larod Stephens-Howling who Cardinals radio broadcasters affectionately refer to as “The Hyphen”. Easily the greatest nickname in the NFC West. Packers 46 Raiders 16 – I wonder if the CBS production trailer ever thought about giving their viewers a live look-in to the Broncos/Bears game on Fox. Can’t imagine there were many folks watching the 4th quarter of this laugher in Lambeau. 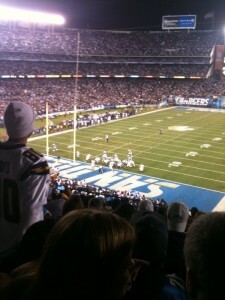 Chargers 37 Bills 10 – It would be soooooo like Norv Turner to save his job during this the final month of the season. Titans 23 Bills 17 – Better late than never for Chris Johnson who has strung together two solid efforts in a row after nearly sleepwalking his way through the entire first half of the season. Probably still doesn’t make him worth all that new money but he has recently helped to keep Tennessee right in the thick of the AFC Wild Card race. 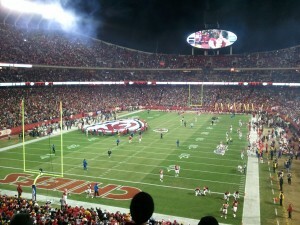 Chiefs 10 Bears 3 – First Jay Cutler now Matt Forte. I wouldn’t expect to see many Caleb Hanie and Marion Barber III jerseys lining the Soldier Field stands anytime soon. Dolphins 34 Raiders 14 – Maybe Reggie Bush wasn’t such a bad signing for Miami after all? And Rolando McClain, you and your aquatic themed rugby shirt will haunt my dreams for years. Broncos 35 Vikings 32 – If Denver takes care of business at home against the Bears next weekend they would then head into their week 15 showdown vs the New England Patriots with a 8-5 record and at least a share of the AFC West lead. Not too shabby for a quarterback that nobody believed in besides Gainesville, twitter, and all of Christendom. Steelers 35 Bengals 7 – Was Cincy exposed as a junior varsity squad or is Pittsburgh once again the real deal? Patriots 31 Colts 24 – Not a bad day for Colts backup backup quarterback, and UConn grad, Dan Orlovsky who threw for 353 yards against a Patriots secondary that looked like they should be playing in the Big, not AFC, East. Panthers 38 Buccaneers 19 – Tampa wore their throwback uniforms and somehow manage to play like it was 1976 all over again. The only thing missing this time around was the Old Ball Coach. Jets 34 Redskins 19 – I was down in DC this weekend and a good friend of mine who works in the District told me that there is a movement afoot to have the team move back to the RFK area. Apparently FedEx Field is a little too inconvenient for the lobbyists on K Street. Heaven forbid that Washington makes a decision without special interests in mind. Texans 17 Falcons 10 – TJ Yates, I really didn’t believe you had it in you. Perhaps the entire Houston team was inspired by the sheer thought of Jack Delhomme lining up under center. Ravens 24 Browns 10 – Ray Rice should have been on the cover of Madden ’12 instead of Peyton Hillis. Packers 38 Giants 35 – Aaron Rodgers has clearly figured out that there is no spoon. Cardinals 19 Cowboys 13 – And yet the cameras continue to focus on Rob Ryan. 49ers 26 Rams 0 – Santa Clara 49ers just doesn’t have the same ring. Falcons 24 Vikings 14 – I’ll give Christian Ponder and Percy Harvin credit, they made this game much closer than most people thought. 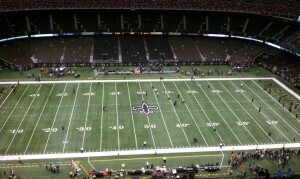 Your move Saints/Giants. Bengals 23 Browns 20 – Peyton Hillis is alive and well but not healthy enough to lead the Browns past Andy Dalton and the Bengals. For Cleveland, is it time to start thinking about how Matt Barkley will look in orange/brown? Titans 23 Buccaneers 17 – Did I call it or did I call it? I told y’all that Chris Johnson was going to bust out and I do believe 23 carries for 190 yards qualifies as a breakout performance. Poor Raheem Morris. Maybe it’s time to dust off the old resume after all. Panthers 27 Colts 19 – You know what they say, horseshoes and hand grenades. Cardinals 23 Rams 20 – How long before Arizona returner extraordinaire Patrick Peterson starts getting the Devin Hester treatment? Also, 228 yards! Who knew Beanie Wells had it in him? I guess the Ohio State alum wasn’t too affected by his alma-mater’s loss to Michigan Saturday. Jets 28 Bills 24 – First, Stevie Johnson mocks Plaxico Burress during a TD celebration and then the Buffalo WR drops a crucial pass from Ryan Fitzpatrick which could have led to a Buffalo score and an improbable last second comeback over the jets. I guess you could say Stevie put his foot in his mouth or rather, shot himself in the hands. Texans 20 Jaguars 13 – I feel for Matt Leinart, I really do. If his season has really come to a close after only one start, I guess it helps to know that he has already made over $20 million serving primarily as a backup QB. I’d say that kinda cash is worth a broken collarbone now and again. Raiders 25 Bears 20 – I was riding with Caleb Hanie until his 3 interceptions, and 6 Sebastian Janikowski FG’s, did the Bears in. It’s going to be very close between the Falcons/Saints/Lions/Giants/Cowboys/Bears for the final playoff spot. Redskins 23 Seahawks 17 – Rex Grossman just proving all the haters wrong once again. Patriots 38 Eagles 20 – The Patriots secondary made Vince Young look like second coming of Randall Cunningham early on but eventually settled down long enough to allow Tom Brady and the New England offense to take over. Speaking of over, could this be the end of Andy Reid in Philly? Broncos 16 Chargers 13 – Who goes first: Andy Reid or Norv Turner? I say Reid, the venom in Philly is much more paralyzing than in San Diego. And Tim Tebow, no postgame handshakes for John Elway until he fesses up and admits that he doesn’t want you to be the Broncos long term solution at quarterback. Browns 14 Jaguars 10 – The good news is that, unless you have Direct TV, this game was probably only on in two markets and I’m still not even sure if Jacksonville is aware that they have a professional football team. Lions 49 Panthers 35 – Matthew Stafford threw for 5 TD’s as the Lions took care of business against the Panthers as they now prepare for their biggest Thanksgiving Day Game perhaps ever. With the undefeated Packers coming to town this Thursday, Detroit has a chance to show the national television audience that they are for real for the first time since the retirement of #20. Packers 35 Buccaneers 26 – Speaking of Green Bay, the Bucs made this game on the Frozen Tundra much closer than most of us anticipated. But in the end, Aaron Rodgers played like Aaron Rodgers and the 10-0 Pack now prepare to feast on a little Turducken. Dolphins 35 Bills 8 – Maybe Matt Moore is the long term answer at quarterback for the suddenly 3-7 Miami Dolphins. For Buffalo, 4-1 feels like eons ago and if things keep trending downward, look for Buffalo to switch uniforms again before next season. Ravens 31 Bengals 24 – Late last night, during the second half of the USC/Oregon game, a little twitter hyperbole took place as a few notable football pundits like Peter King, lined up to praise Matt Barkley and begin to question if the Trojan quarterback might just as well turn out to be a better pro than the anointed one Andrew Luck. I liked what I saw from Barkley last night, but if we’re going to talk about an “under the radar” college quarterback who could end up being the goods in the pros, look no further than Waco, Texas and Baylor star Robert Griffin III. Dude is electric. Seahawks 24 Rams 7 – In any other season, the NFC West would be the Seattle Seahawks to lose. And poor Sam Bradford. Are the St. Louis wide receivers that bad or do the Rams need to look for another franchise QB? 49ers 23 Cardinals 7 – A Happy Harbaugh Day to the brothers Harbaugh as Jim Harbaugh brings his 9-1 49ers into Baltimore to take on brother John Harbaugh and the 7-3 Ravens on Thanksgiving night. Apologies in advance if you do not get the NFL Network. Falcons 23 Titans 17 – Jake Locker the future is now. Well, probably in a few years as Tennessee starting QB Matt Hasselbeck will probably be back next week after suffering a minor arm injury against Atlanta. The Falcons look to be one of 4 teams along with the Cowboys, Bears, Lions battling for the 2 wild card spots. Bears 31 Chargers 20 – Speaking of Chicago, Jay Cutler took care of business once again as the Bears look like a legit obstacle in the Packers path to perfection. And Philip Rivers, enjoy the bench as I’m poised to announce Big Ben Roethlisberger as my fantasy starter for the remainder of the season.